It is time for a super silly underwear book list. Getting boys reading and enjoying books is one of our big goals here on Brain Power Boy which is why we spend a whole lot of time choosing the best books for boys and putting them into handy lists for you to use. Reading funny books is a nice way to spend some time together. Read, laugh, make your own jokes, and play around with words. It’s all great fun! Pick up a few of these Underwear Books and have a crazy reading session. Whether you call them underwear, underpants, shorts, briefs, boxers, or something else entirely, reading these books together will guarantee some laughter. A crazy war is started when TRex wants a caveman’s underwear in this rhyming picture book, Dinosaurs Love Underpants . Dinosaur fans won’t like the ending but we are all now safe to wear underwear. In Pirates Love Underpants they set out to find the fabled Pants of Gold. Fun things like sharks in underwear at Big Knickers Bay, and Long-John Bridge lead you through this romping, rhyming pirate underpants book. There is another book called Monsters Love Underpants along the same lines but with silly monsters. You do want to know how underwear saved the universe, right? Find out in Aliens in Underpants Save the World Rhyming style and fun, crazy illustrations of aliens. Bright, bold illustrations with a soft fabric underwear cutout on the front cover make Bear in Underwear a fun choice. 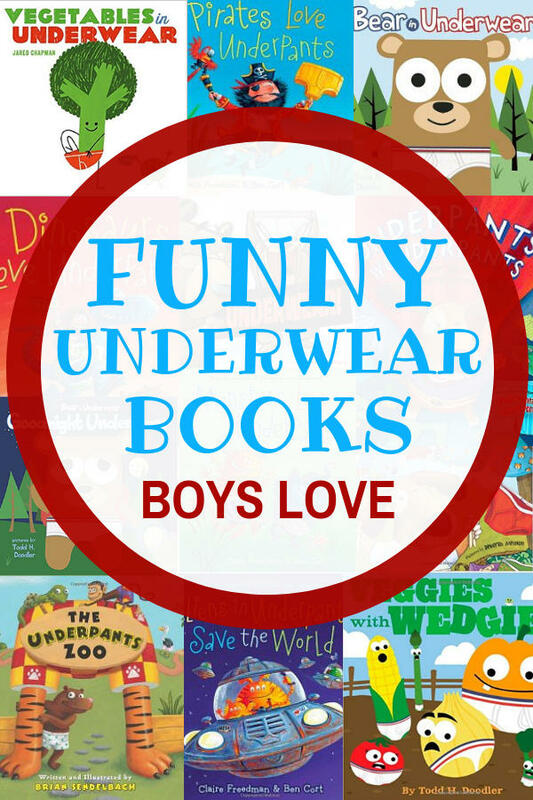 Perfect for young boys who are ready for undies or just for a silly read. For an amusing take on Goodnight Moon try Goodnight Underwear . It starts “In a great green forest. There was a little cabin. And a nice campsite. And a campfire . . .” Funny stuff. A cute dog hangs his underpants on the line when along comes a storm . . . Find out what happens in Underpants Thunderpants . From the same author as Underpants Thunderpants, comes Underpants Wonderpants . The dog is now a Superhero! (see our Superhero Picture Books if your boy is a fan) He is out to help those in need, with an underpants-style rescue. Animals in a zoo and underpants. You can’t really go wrong with that idea! The underwear styles are funny–Zebra prefers ones with stars! See all of the animals in their underwear at The Underpants Zoo . Laugh along with this book called Vegetables in Underwear. It is a rhyming book that focuses on big boy underwear in an amusing way. The characters are funny and the illustrations are cute. Another choice by the same authors is Veggies with Wedgies. Oh my! People certainly do have quirky imaginations. In this book Farmer John’s underwear is hung out to dry and discovered by the veggies who want to try to on . . . but how?! This one looks promising but it isn’t out yet. Pretty sure it is going to be a winner and I will grab it as soon as I can to take a look! If you want to delight a young boy who hears the word “underwear” and can’t help but smile, try a few of these super silly picture books soon. Make sure you don’t read for just a “brief” period of time ;), as reading with boys is one of the best things you can do to help them learn. That holds true even when you are reading about underwear! For more books boys will enjoy <<<<click here. Glad you enjoyed it. There are certainly some funny ones out there! These look great. Even my daughter love the underwear books. There’s one called What Color is Your Underwear. I overhead my daughters preschool teacher reading it to the class once and the kids were in hysterics! I had to ask her what she was reading and now we own a copy too and she can’t get enough of it!! Pinning! Yes, they are very funny. Thanks for the additional suggestion! How fun! I’d be giggling right along with ’em! Stopping by from the Kid Lit Blog Hop. Yup, they are pretty silly for sure. Thanks for stopping by. Wow, thanks so much for joining our hop and for posting your hilarious underwear books list. You know, until now I have managed to avoid all underwear books having a little girl, but the reality of now carrying a boy, means that these are going to become standard issue in our house. Great to meet you. LOL Julie, well perhaps you will dodge it anyway. I do know a few boys who don’t find underwear all that amusing (but not many!) Nice to meet you too–thanks for stopping by. Books like this were always a hit with my boys. There’s a few here I haven’t read so I’ll have to pick them up for my grandsons to enjoy. Thank you for sharing! Thank you for your comment Stacie. Hope the grandsons enjoy the books!